Bus services in Preston and South Ribble are about to undergo some major changes. Preston Bus, operated on behalf of Lancashire County Council, will make changes to a number of routes from Monday, February 18. The biggest change will see a new hourly bus service launched, which will restore public transport access to Longsands Estate. The new 15 service will operate between Preston City Centre and Longsands via Deepdale Road and Watling Street Road, looping Longsands anti-clockwise. Rotala Preston Bus will operate this service roughly every hour during Monday to Saturday daytime. Service 29, which runs between the city centre and Frenchwood, will also be withdrawn. The new hourly 15 service will restore public transport access between Preston city centre and Longsands via Deepdale Road and Watling Street Road. Lancashire County Council will withdraw this service and incorporate the Frenchwood Loop within the revised Service 112 route (Preston – Bamber Bridge – Clayton Brook – Leyland). The revised service 112 will extend services in South Ribble, with Leyland benefiting from a new route via Golden Hill Lane to Moss Side Industrial Estate and Midge Hall (replacing a revised Service 114 route). In Leyland, revised 114 will only operate direct between Croston Road and the town centre via Broadfield Drive. This will result in the loss of a direct route to Chorley from Moss Side and Midge Hall, but Lancashire County Council said that the numbers actually making this journey are extremely low. Passengers will continue to be able to make connections in Leyland town centre with alternative services. 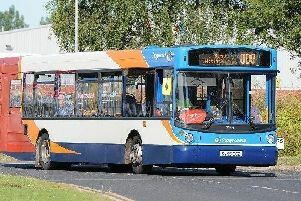 Changes are also being made to the Fylde Villager 75 service (Preston – Kirkham – Poulton – Cleveleys – Fleetwood), with a new timetable and route in Fleetwood. Lancashire County Council confirmed the 75 service will no longer serve the Windward Avenue Estate due to extremely low usage. Windward Avenue was added to the route following customer requests after the new estate was built. But due to extremely low usage, the service will no longer stop at the estate. According to Preston Bus, there has been less than one passenger on average per trip on journeys serving the estate. Passengers from Windward Avenue face a 23-minute walk to the nearest alternative bus service at Fleetwood Freeport, or at the new bus stops on Denham Way. The new route for service 75 will operate direct along Amounderness Way, Denham Way and Copse Road. Service 76 (Lytham – Kirkham – Great Eccleston – Poulton – Blackpool).